Laurie Flynn says her new role with Link to Libraries enables her to make her passions — reading and children’s literature — her profession. Laurie Flynn says it’s not often that one gets to make their passion their profession. And it was the opportunity to do just that which prompted her to put aside a budding marketing business she co-founded a few years ago and become president and CEO of Link to Libraries (LTL), the decade-old nonprofit that, as the name suggests, puts books on the shelves of school libraries and other agencies and promotes childhood literacy on many levels. “It just seemed like this serendipitous, perfect opportunity to bring together what I’ve learned professionally and my personal passion for children’s literature, and also for reading and writing,” said Flynn, who has made LTL only the latest example of making her passion her work. Indeed, Flynn, who returned to college (Simmons College in Boston, to be more specific) in 2011 to earn a master’s degree in writing for children, has long been a children’s book reviewer for Kirkus Reviews, handling middle-grade and young-adult books across all genres. And for nearly two years, she was the Western Mass. regional coordinator for Reach Out and Read, a nonprofit that works to incorporate books into pediatric care and encourage families to read aloud together. Desiring to take her work with literacy and children’s literature to a still-higher level, Flynn assumes many of the responsibilities carried out by Susan Jaye-Kaplan, co-founder of LTL, as it’s called, along with Janet Crimmons, in 2007. Jaye-Kaplan told BusinessWest she will remain quite active with the organization, as a board member, fund-raiser, and volunteer, among other roles, but acknowledged that, as LTL continues to grow, geographically and otherwise, it was time for the nonprofit to hire a paid, full-time president. LTL’s warehouse at Rediker Software is crammed with books bound for area schools and nonprofits. Flynn, who moved into LTL’s donated office space at Rediker Software in Hampden in late September, told BusinessWest that her first few months will be spent “learning the territory,” a phrase with multiple meanings. First, there is the actual physical territory, meaning the dozens of schools and nonprofits across Western Mass. and Northern Conn. that LTL serves; she’s already visited several, and more trips are scheduled. There is also LTL’s operating structure, complete with a network of hundreds of volunteers handing assignments ranging from reading in the classroom to packing books bound for area schools. And there’s still more to that word ‘territory,’ including everything from the art and science of selecting the books that will be distributed to soliciting new sponsors for LTL’s hugely successful Business Book Link program, which recruits businesses large and small to sponsor individual schools. Actually, Flynn was already familiar with much of this territory through her work reviewing books, with Reach Out Read, and also work as an LTL volunteer. Indeed, she was, and would like to go on being, a volunteer reader at Homer Street School in Springfield. But she acknowledges that she has much to learn, and is eager to get on with doing so. For this issue and its focus on education, BusinessWest talked with Flynn about her new role and her decision to turn her passion for books and childhood literacy into her new business card. Flynn brings an intriguing résumé to her role with LTL, one that includes time working in both Parliament and the U.S. Capitol. The former was a relatively short stint — an internship undertaken while she was enrolled at the London School of Economics in 1993. The latter was much more involved, covering the first half-dozen years of her professional career. A Washington, D.C. native, Flynn started working as deputy press secretary for U.S. Sen. Judd Gregg (R-New Hampshire) in January 1995, and a year later became his press secretary, serving in that role until 1998, when she became communications manager in the office of the Secretary of the Senate. In that role, and also as a staff assistant handling special projects and communications in the office of the Clerk of the House, she was heavily involved with press inquiries and other aspects of construction of the $621 million U.S. Capitol Visitor Center (CVC), a large underground addition to the Capitol complex that opened in 2008. After relocating to Western Mass., she became an independent communications consultant, specializing in event planning and execution, product launches, and writing of documents related to corporate marketing and mission. And after spending two years with Reach Out and Read, she co-founded Red Mantel Communications (her partner had a red mantel in her home, where the two would often brainstorm), which specialized in media and public relations, event planning, and other communications-related work. Among her clients was Balise Motor Sales, which had already forged a unique relationship with Homer Street School — the late Mike Balise, a principal with the company, purchased winter coats for students there — and took it to a higher level by adopting the school through LTL’s Business Book Link program. 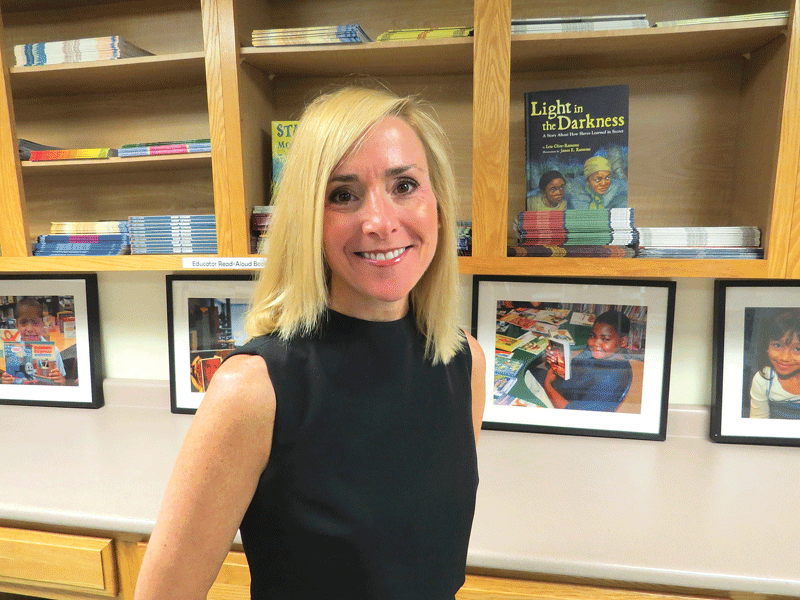 Flynn, who read to fourth-graders at Homer Street, said she was content in her work with Red Mantel, but when she heard that LTL was going to commence a search for its first full-time paid director, she became intrigued. But first, she needed convincing that Jaye-Kaplan, the energetic face of the nonprofit, was really going to take at least a small step back in her role as leader of the agency. The position attracted a number of applicants, most of them with backgrounds in education, nonprofit management, or both, and Flynn eventually prevailed in a search process that ended in early September. Looking ahead, Flynn said her informal job description is to build on LTL’s solid foundation and advance its work to not only put books on library shelves and in students’ hands, but to encourage young people to read and impress upon them the importance of doing so to attain jobs and careers. 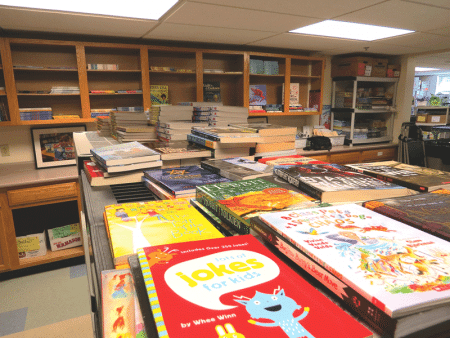 “I just have a deep love and appreciation for the importance of reading in kids’ lives,” she told BusinessWest, adding that the Business Book Link program is an important part of this mission. And not simply because the businesses donate money to purchase books for the schools they’re sponsoring. A perhaps even bigger component is how those businesses become involved with the schools — by reading to students, but also funding field trips and other initiatives — and having their employees visit the classrooms and become role models of sorts. “That community involvement, and getting representatives of the business world to come into the classroom and take the time to sit down with those kids … that’s just so important and so unique,” Flynn explained. Overall, she said would like to see the organization broaden its work and its mission in some important ways, but without ever straying from its reason for being. As she contemplates how to do that, Flynn said the region’s many noted children’s authors, including Jane Yolin, Holly Black, Richard Michelson, and others, could play a role in such work. As LTL celebrates 10 years of carrying out its unique mission, this is an appropriate time to pause and reflect, said Flynn, adding that the milestone, and her arrival as the first paid director, are turning points for the organization. Together, they symbolize the beginning of a new chapter in the history of the agency. And while the specific plotline of this chapter isn’t known yet, the story is likely to be one of continued growth and deeper impact within the community. As for Flynn, she is excited to be helping to script this chapter. That’s to be expected when your passion becomes your life’s work.